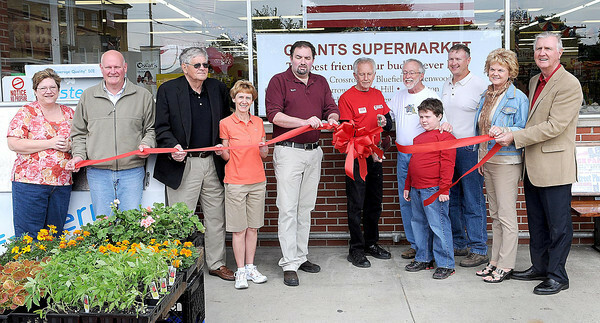 F. BRIAN FERGUSON/THE REGISTER-HERALD=The official Grand Opening of Grant's Supermarketwas held Saturday in Oak Hill. (From left) Damita Johnson, Oak Hill City Manager Bill Hannabass, Oak Hill Mayor Bill Dickinson, Councilwoman Diana Janney, Grant's Owner Ron Martin. Manager Bob Black, Tom Oxley, Wyatt Oxley, Grant's Owner Ronnie Cruey, and Owners Rosemary and Randle Grant.